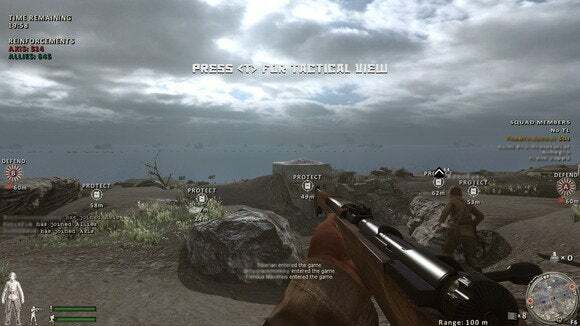 You can talk about all the fancy graphics, crazy guns and manic run-and-gun gameplay all you want, but the modern shooters of today are missing that special something—immersion. Rising Storm is different. Red Orchestra 2's expansion, Rising Storm, takes you away from the European theater of WWII and throws you deep into the jungle and beaches of the Pacific. It lacks the glamour and polish of games like Call of Duty and Battlefield, but it compensates with the rarified charm that comes from spending a few hours in a Pacific Rim trench. The average Rising Storm match looks less like a competitive videogame than a scene cut from a World War II documentary. We won't truly ever be able to understand what the soldiers of WWII went through, but Rising Storm may be the closest I'm willing to get. Iwo Jima is dark, gritty and large. A recipe for a violent encounter. Huddled in a foxhole on the beach of Iwo Jima or in a ravaged trench in the jungles of Guadalcanal, you keep your head down as you hear, and feel, the bullets whizzing by. Rising Storm does suppression so well, you can't help but freeze and retreat slowly, crawling on your stomach until you feel relatively safe. If all hell begins to break loose around you, the screen grays out, a red pulsing color surrounds the screen, sound becomes garbled and you lose your ability to zoom. All you can do is hunker down and hope it stops so you can regain your composure. The MG placements don't have a lot of ammo but will stop a soldier instantly. But video games have taught us that bullets aren't that scary. You get shot a few times, you run to cover and wait until the screen stops glowing—time heals all wounds. Not here though—here, the danger is real. One well-placed shot can send you right back to the respawn queue where you wait up to 20 seconds to respawn back where you started—a significant sprinting distance away. Even if the shot doesn't kill you, you only have a short time to use one of your two bandages to patch up before you bleed out. Staunch the bleeding and you'll still be hobbled: a leg wound means you can't run as quickly, while a wounded arm will skew your aim. Suffer a wound to the heart and head and, well...you're dead. Rising Storm doesn't mess around. A typical match consists of two rounds of attacking or defending key points on the map. When the attackers manage to take a point the defenders retreat to a new point. Each side also has a finite number reinforcements that slowly deplete every time a member dies. Run out of reinforcements and they lose the ability to spawn, leaving the remaining team alone against an overwhelming force. A set time limit puts the pressure on the attackers, who need to push forward or risk losing momentum. The Japanese can bury grenades for some nasty mine traps. American and Japanese forces employed very different weaponry and tactics during World War II, and that disparity is represented well in Rising Storm. The Americans possess some serious automatic firepower—Thompsons and Browning Automatic Rifles along with classic Springfield and M1 Garand rifles. If that's not enough, you've also got access to a flamethrower—able to shoot hot death at a distance, perfect for cleaning bunkers and trenches. Players on the Japanese team rely on bolt-action rifles but have the ability to bury their grenades to create booby traps and have portable mortars to devastate troops in cover. There is also a banzai attack that allows players to run further with damage resistance that stacks if you surround yourself with other banzai-ing teammates. The Japanese can quickly break through American lines and fight in devastating blade-to-chest bayonet combat. The two sides play very differently, but the game is surprisingly balanced if teamwork and communication are present—easy to do with the in-game VoIP system. To keep everyone on the team from rushing for the nearest flamethrower, players are encouraged to pick a role for themselves on the team. The Commander manages recon planes and launching artillery, Squad Leaders spawn their squad of 5-6 men at their location, and everyone else fills weapon-specific roles. In my matches we always had room for 2-3 flamethrowers, 2-3 machine gunners, a couple snipers and plenty of riflemen—the backbone of both sides. 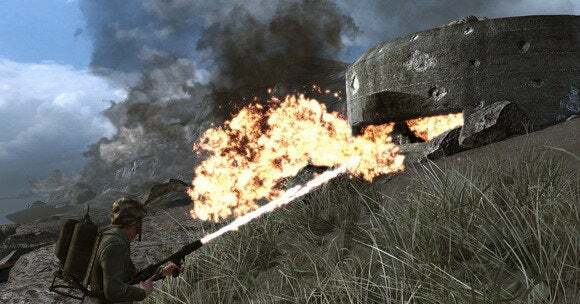 Pyromaniacs rejoice and say hello to the flamethrower. A ranking system is used for every gun—leveling up will increase things like accuracy and stopping power—and class, as well as your overall Honor Level. Having a higher level may gives you priority over other players when selecting higher-ranking classes like the Commander. On the surface, Rising Storm is a dated-looking WWII first-person shooter with some fun mechanics—a simple cover system, lean controls and realistic damage, for example. But as you learn the ropes and throw yourself at the death's door time and time again, the deeper mechanics come to light. Playing with a competent team coordinating via voice communication allows you to execute coordinated attacks from different angles, pop cover for your team with smoke grenades and pull off massive front-line assaults that can crush an opponent that outnumbers you. When all that comes together, it's honestly one of the most addictive shooters I've ever played. It's available now on Steam for a cool $20. An immersive game that makes the danger feel real while still being a fun, addictive shooter. Immersive combat with just enough historical context.